Dec. 2, 2011: Waking up before sunrise can be tough to do, especially on a weekend. On Saturday, Dec. 10th, you might be glad you did. A total eclipse of the Moon will be visible in the early morning skies of western Northern America. 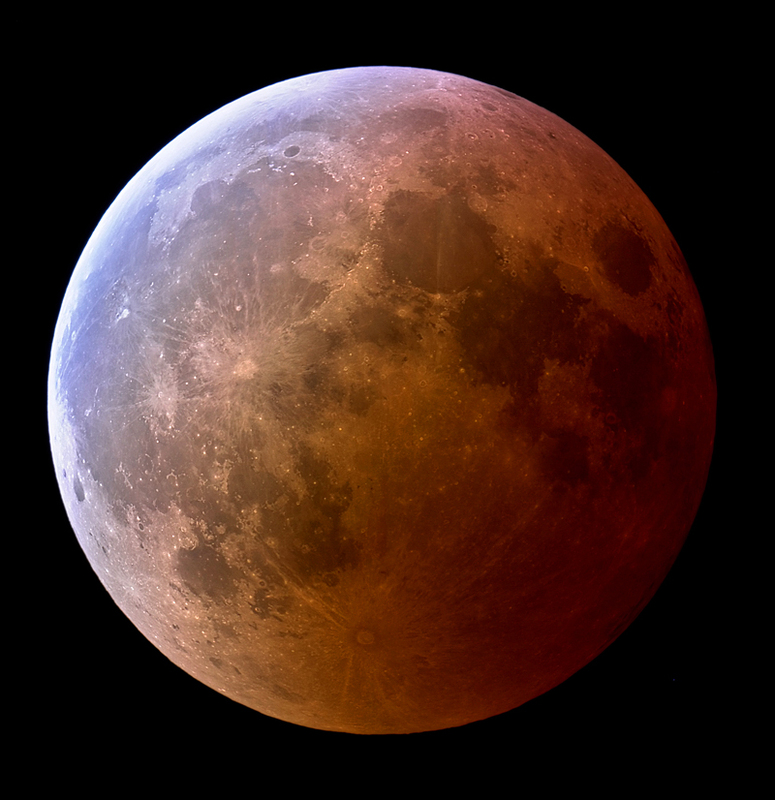 The action begins around 4:45 am Pacific Standard Time when the red shadow of Earth first falls across the lunar disk. By 6:05 am Pacific Time, the Moon will be fully engulfed in red light. This event—the last total lunar eclipse until 2014—is visible from the Pacific side of North America, across the entire Pacific Ocean to Asia and Eastern Europe: global visibility map. 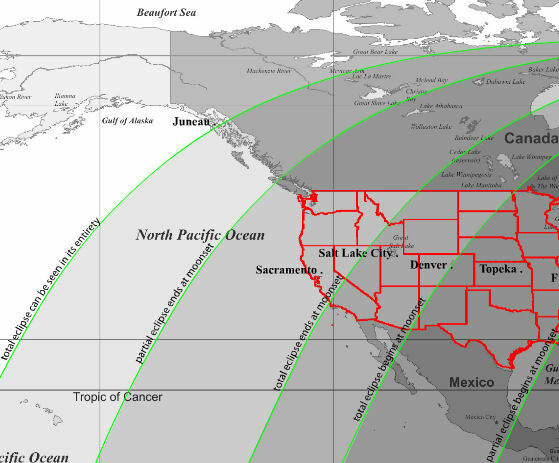 For people in the western United States the eclipse is deepest just before local dawn. Face west to see the red Moon sinking into the horizon as the sun rises behind your back. It’s a rare way to begin the day. Not only will the Moon be beautifully red, it will also be inflated by the Moon illusion. For reasons not fully understood by astronomers or psychologists, low-hanging Moons look unnaturally large when they beam through trees, buildings and other foreground objects. In fact, a low Moon is no wider than any other Moon (cameras prove it) but the human brain insists otherwise. To observers in the western USA, therefore, the eclipse will appear super-sized. It might seem puzzling that the Moon turns red when it enters the shadow of the Earth—aren’t shadows supposed to be dark? In this case, the delicate layer of dusty air surrounding our planet reddens and redirects the light of the sun, filling the dark behind Earth with a sunset-red glow. The exact hue (anything from bright orange to blood red is possible) depends on the unpredictable state of the atmosphere at the time of the eclipse. As Jack Horkheimer (1938-2010) of the Miami Space Transit Planetarium loved to say, "Only the shadow knows." Atmospheric scientist Richard Keen of the University of Colorado might know, too. For years he has studied lunar eclipses as a means of monitoring conditions in Earth's upper atmosphere, and he has become skilled at forecasting these events. "I expect this eclipse to be bright orange, or even copper-colored, with a possible hint of turquoise at the edge," he predicts. Earth's stratosphere is the key: "During a lunar eclipse, most of the light illuminating the moon passes through the stratosphere where it is reddened by scattering," he explains. "If the stratosphere is loaded with dust from volcanic eruptions, the eclipse will be dark; a clear stratosphere, on the other hand, produces a brighter eclipse. At the moment, the stratosphere is mostly clear with little input from recent volcanoes." Clicking on this image takes you to an interactive visibility map courtesy of Larry Koehn, ShadowandSubstance.com. That explains the brightness of the eclipse, but what about the "hint of turquoise"? "Light passing through the upper stratosphere penetrates the ozone layer, which absorbs red light and actually makes the passing light ray bluer. This can be seen as a soft blue fringe around the red core of Earth's shadow." Look for the turquoise near the beginning of the eclipse when the edge of Earth's shadow is sweeping across the lunar terrain, he advises. 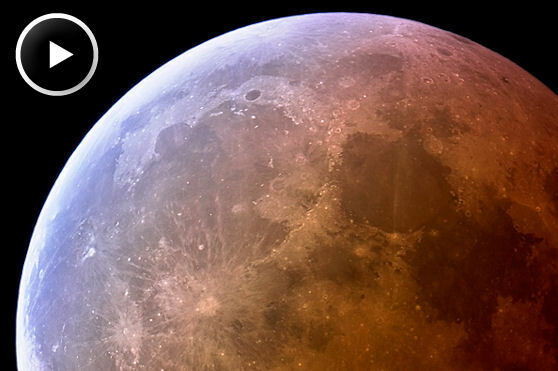 A bright red, soft turquoise, super-sized lunar eclipse: It’s coming on Saturday, Dec. 10th. Wake up and enjoy the show.